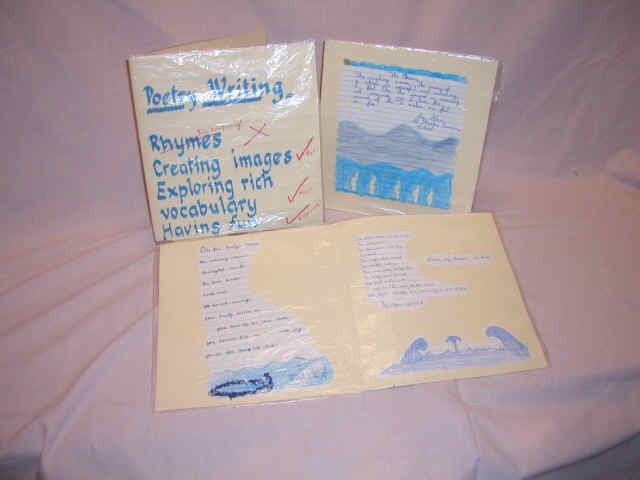 Poetry Writing - Show Me WOW! 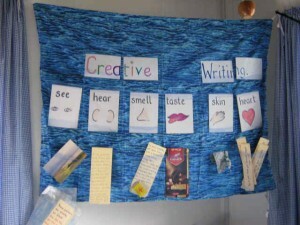 There are so may ways of helping children to write poetry, most of which are great fun, as, of course, they should be! Poetry is a collection of succinct ideas that express the spirit of the writer in a way that communicates directly with the reader. Poetry writing is not necessarily a list of lines with rhyming endings. Telling children to make the ends of lines rhyme is too confining and too often stifles the quality of the finished poem. This is where the child gives a list of spoken ideas and someone writes them down. what he feels in his heart! Set the atmosphere in the classroom, calm, still relaxed…and quietly exciting! 1) Use a stimulus. I chose music on a theme of ocean. Have piles of offcuts or strips of paper near each poet. 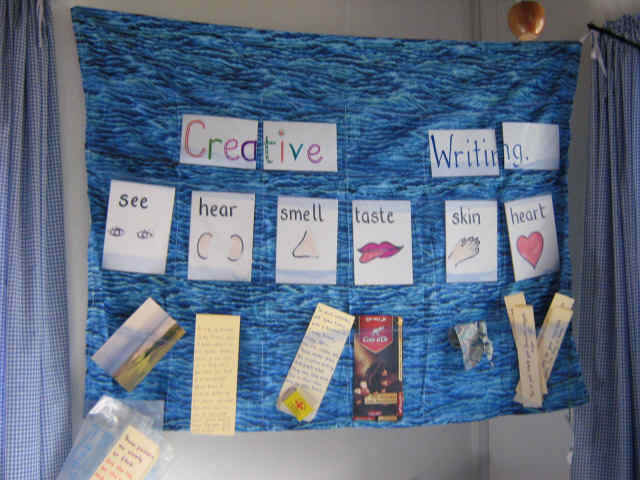 Invite the poets to each take one piece and, whilst listening to the music, write down a thought or few words that the theme inspires in them. Each poet reads his or her one line, followed by increasing the volume on the music and then decreasing it ready for the next poet’s line. 4) Then, with the Producer, having had the final say on the line-up, the group do a polished “radio” performance. 5) The poets are now ready to work on their own, with the music playing and with them adding more lines on the strips of paper, and then re arranging the strips to get their preferred order. 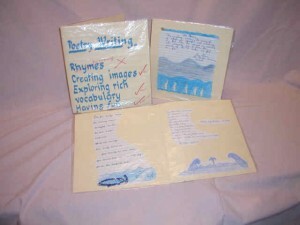 Then the poems are written out as best copies to perform or for display in a book or on the classroom wall. 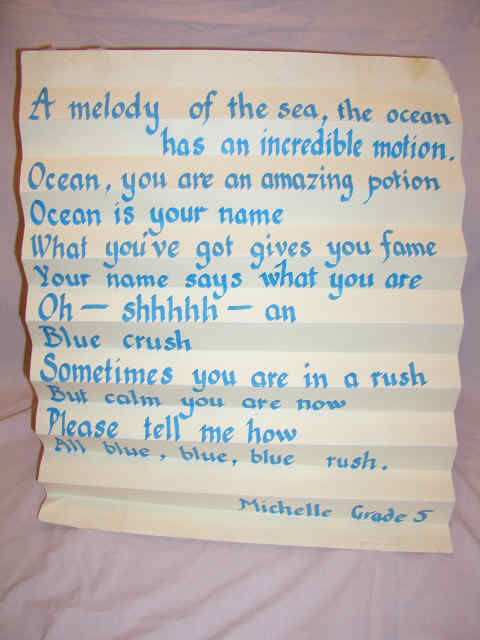 Below are some of the poems written using the above method and on a theme of “Ocean”. Some of the children exclaimed this was the best wrtiting they had ever produced. They glowed with pride, as did their parents and visitors to the school. A melody of the sea, the ocean has an incredible motion. 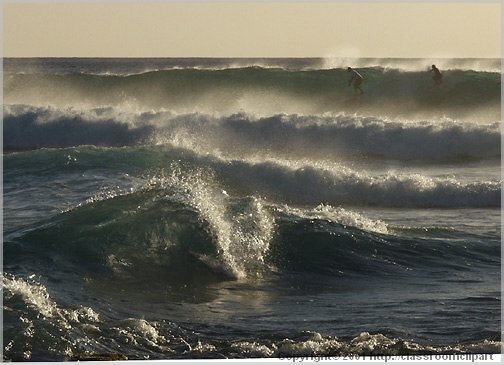 Ocean, you are an amazing potion. Ocean is your name, what you’ve got gives you fame. colours never cease to amaze me. Your voice is a melody singing sweetly. Relaxation is your motto, love is your key. You are like a butterfly flying over the sea.